Scanning the huge water tank at Ulsoor lake on the last day of Ganesh Chaturthi, I saw many murky shapes and shadows just beneath the surface of the water. This is where Ganesh idols of all sizes, some so huge they need to be lifted by crane, are submerged at the end of the 10-day festival. Floating on the surface were flower garlands, plastic bags, chunks of plaster, pieces of wood and clumps of earth. I also saw blotches of colour rising up to the surface. The municipality recommends that only idols made with natural colours be used, to avoid pollution of lakes with toxic metals used in paints. Flower garlands and decorations are removed from the idols at the gate before they're carried in to be immersed in the water. The effigies are made of clay or soil and dissolve easily once in contact with water. Here the BBMP workers are fishing out some of the bigger idols from the tank. The job wasn’t easy. This statue seemed to be very heavy. A mess of limbs, the stripped straw skeletons of the idols are piled up next to the water tank. People come here to scavenge for firewood. 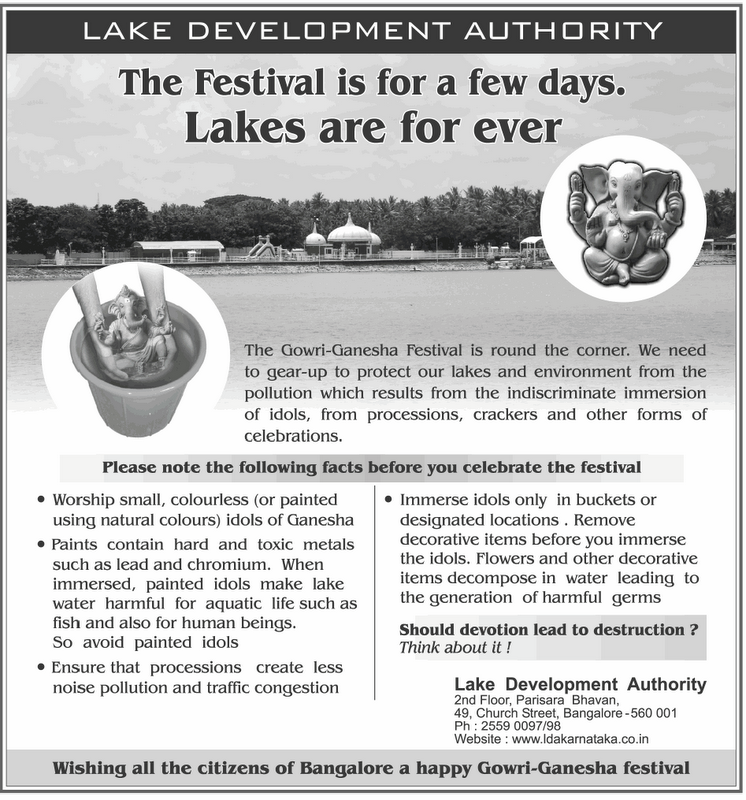 The authorities try to sensitise people to the environmental effects of this festival by issuing guidelines. This blog post talks about the environmental aftermath of the Ganesh festival in Bombay where 100,000 idols are dumped into the sea every year! Very sad..It must be heart breaking for the artisans who make this and then to see it all thrown away so callously. Just the previous day they show so much "bhakti"and then the next day,they just dump it with out a care. Dumping grotesque idols in the lakes of a city that has a severe water shortage - if this is not a crime against humanity, then what is? To quote Salman Rushdie (Midnight's Children) "the hegemony of superstition, mumbo-jumbo and all things magical would never be broken in India" - alas. There was an article in today's paper about the aftermath of this festival on the city's lakes. Grim reading! Isabel, enjoyed this post and the photos, as always. I have read about the environmental impact of the Ganesh festival--I assume the tank of which you speak helps contain the "pollution" (for lack of a better word. It will be interesting to see how India copes with the dual pressures of increasing environmental concerns and ingrained cultural practices. Yes, you're right Elizabeth, the separate tank is meant to keep the idols out of the lake. But not all of the city's lakes have this and they're dumped directly in the lake. Or in the sea in the case of Bombay. I think people are slowly becoming more and more aware of the environmental consequences of their actions. Your pictures are oddly beautiful. The holiday's exuberance can still be seen in the colorful decaying flowers. It is true that India's religious celebrations can be seen as wasteful. I liken it much to sporting events or weekend festivals in the west where many use it as an excuse to drink to excess. In a state of euphoria (much like Indians get during Diwali, Holi, Ganesh Chatuthi), people do things they normally would not do or agree others doing, yet they feel compelled to release the pressures of life. It is excused by too much drink or in the name of a Hindu god. Either way we continue to find a way to soil our home.